Heat the oven to 275°F. Line a rimmed baking sheet with parchment paper. Beat the egg white in a large bowl with an electric mixer on high speed until stiff peaks form. Gently stir in the brown sugar and 1/2 teaspoon vanilla extract. Add the pecans and stir to coat. Spread the pecan mixture on the baking sheet. Bake for 25 minutes or until the pecans are browned and no longer shiny. Let the pecans cool completely on the baking sheet on a wire rack. Reserve 1 1/2 cups candied pecans for the filling and save the rest for another use. Beat the cream cheese and granulated sugar in a medium bowl with an electric mixer on low speed until the mixture is smooth. Add 1 egg and the remaining vanilla extract and beat until just combined. Increase the oven temperature to 400°F. Beat the remaining egg and water in a small bowl with a fork. Unfold 1 pastry sheet on a lightly floured surface. Roll the pastry sheet into a 10-inch square. Spread half the cream cheese mixture down the center of the pastry square. Sprinkle the cheese mixture with 3/4 cup reserved pecans. 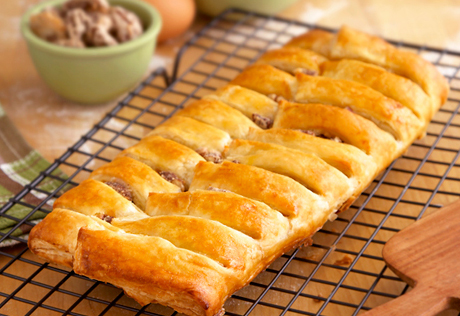 Cut slits 1 inch apart from the 2 sides of the pastry to within 1/2 inch of the filling. Starting at one end, fold the pastry strips over the filling, alternating sides, to cover the filling. Repeat with the remaining pastry sheet. Place the filled pastries onto 2 baking sheets. Brush the pastries with the egg mixture.